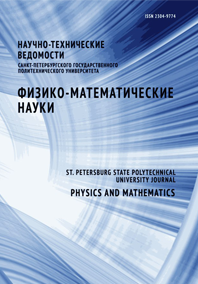 Smirnov Mikhail B. Pankin Dmitry V.
Polar optical phonons in quaternary nitride-based superlattices have been investigated in the framework of dielectric continuum model. In the considered systems, the superlattice period consisted of two main layers GaN and AlN and two interstitial layers Al0.5Ga0.5N. Such structure simulates binary superlattices with diffuse interfaces. The presence of the finite thickness interface layers was shown to give rise to appearance of several low-intensity additional phonon modes active in Raman scattering; frequency splitting of such modes is sensitive to relative thickness of intermediate layers. The fundamental Raman-intense polar phonon modes were also stated to be independent on the interface thickness, and these modes being very sensitive to the main layer thicknesses.